Vita Vite features artwork from a variety of southern artists. Vita Vite is an inviting space with a relaxed, welcoming atmosphere. 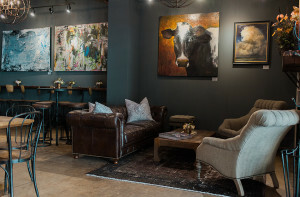 The main bar and art gallery allow customers to browse artwork from southern artists in a setting where they can visualize it in their homes. And if they find a piece that speaks to them, they can purchase it. Beyond an appreciation, we have a background in art history. We know our audience and what they’ll like. Our gallery presentations ensure each piece is framed with creative ambiance and shown in the best light. If you are interested in showing your work in one of our two art galleries, we’d love to see what you’ve got. Fill out the form below to get started.